Tim Oliver is an Ohio native who cut his teeth fishing for bass and walleye with conventional gear. In 1985 he moved West to go to grad school at ASU and has never looked back. In 1990 he purchased his first fly rod, a Sage RPL 6 wt. and was hooked. Being the crafty type, he also started tying his own flies and building fly rods. Being a fast learner, his flies got noticed by some of the local fly shop owners and they convinced him to tie some of the local lake patterns that were not available from the large commercial companies. Tim really enjoys cold water fisheries where he can fish for his beloved trout. Through the years, Tim has honed his tying skills and has tied thousands of flies. Tim is an accomplished nymph fisherman and can hold his own on the many lakes around Arizona and across the West. Tim’s philosophy on flies is that they should be simple to tie and simple to fish. He enjoys sharing his knowledge of fly tying and fishing and regularly gives away flies to other fishermen he comes across. 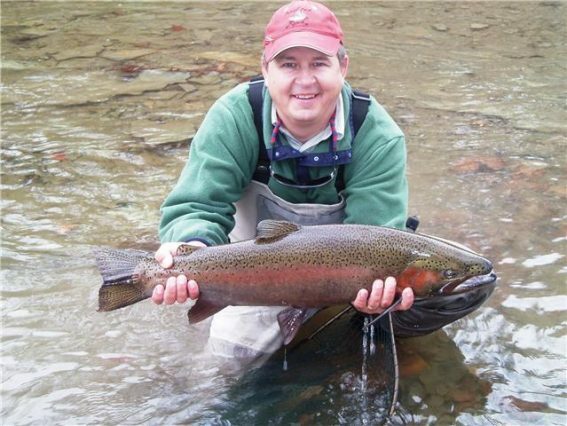 Tim has traveled all this country fishing for trout and steelhead. If you come across Tim out there on a stream or lake, don’t forget to say hi and ask what is working.